Web Based Remote Monitoring | MaxBotix Inc.
Web-based remote monitoring for the MaxSonar is easily available with the help of a bridge device such as the ioBridge IO-204. It has become simpler to integrate a MaxSonar into applications like measuring tide level or fuel level. The ioBridge IO‑204 module allows for remote sensing over the internet. All that is needed is a MaxSonar of preference, the IO-204, high-speed internet connection, and a power source for the IO‑204. 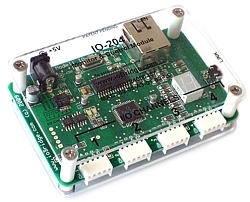 The ioBridge IO-204 is a small remote sensing module that allows for monitoring and control of up to 4 devices remotely using analog voltage inputs and digital I/O ports. All interfaces operate within a voltage of 0 to 5 volts. 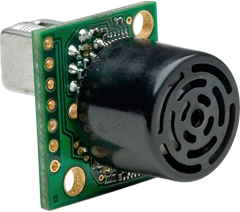 The module provides a power supply of +5VDC to any device it is monitoring and/or controlling. 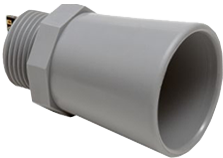 All connections provided are standard 0.100-inch headers, creating an easy way to hook up sensors or other electronics. The module does not use USB ports for direct connection to a computer. Instead, it communicates using Ethernet directly to the ioBridge web server, creating a nearly work-free remote sensing solution. All monitoring and control occurs on the ioBridge website by the end user. To get started using a MaxSonar ultrasonic sensor and IO-204, the user needs to link the module to a user account on the ioBridge website. If the end user doesn’t have an ioBridge user account, one will have to create an account first. After the account has been created and verified, the user account home page will have an option to “Link Module”. The IO-204 module is so easy to set up and configure, it takes approximately 5 minutes to link the module to the account from start to finish. Linking a module to a user account is a simple and quick process. It requires an active internet connection to the IO-204, the module serial number, and a set of 3 numbers that the IO-204 will output on the LED during the linking process. After the link is complete, ioBridge will direct the user to a status page online where the four individual channels of the IO-204 can be monitored or Widgets can be created. 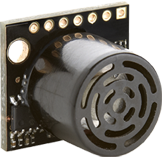 Currently, analog voltage is the only output from the MaxSonar that the IO-204 can monitor for determining distance. To create a basic widget for monitoring the MaxSonar, select the “Widgets” tab on the top of the user account page menu bar. On the new screen, there will be an option that says “Create Widget”. A menu appears that asks whether to use, “I/O Channel Widgets”, “Variable Widgets”, or “Servo Channel Widgets”. Select “I/O Channel Widgets” to get started. After the widget selection has been finished, the final page is the widget that has been created. The created widget has a basic interface that updates with new range readings. The landing page allows you to choose the analog input scale, if auto-refresh is on or off, and the style of the widget. When “Analog Input Scale” is set to RAW, the analog voltage output from the sensor will be read by the IO-204 analog-digital converter and read by the end user as the range the sensor is detecting an object. Setting the scale to analog voltage will allow the widget created to output the analog voltage of the sensor so it can be calculated manually. The analog input on the IO-204 has a 10-bit analog to digital converter (ADC), meaning it creates a digital value from 0 to 1023 (2 to the 10th, minus 1). For standard XL-MaxSonar sensors, there is no math needed to read the range from the sensor; the calculated digital value from the ADC is the reported range in centimeters. For operation with the XL-MaxSonar long-range sensors, the output needs to be multiplied by 2 for the proper distance, and for operation with the HR-MaxSonar sensors, the output needs to be multiplied by 5 for the proper distance in millimeters. When working with the “Dial” or “Gauge” widgets, the user is able to configure the designation for the minimum and maximum reported distance. When the range reported is out of the designated range the range reading will show in red text. This works well if measurement within a specific data set is required. Other users of ioBridge products have created Widgets that use custom interfaces that can convert to different units of measurement like gallons, feet, etc. ioBridge supplies a tutorial on creating HTML widgets in their tutorials here. ioBridge has a tutorial that shows how to write expressions for ioBridge Pro here. Custom written expressions allow widgets to automatically do the math to convert readings to feet, do the math automatically for the long-range or high-resolution sensors, or convert to other units of measurements. ioBridge has also just released a product that allows for wireless monitoring and reads the serial output of the sensor directly as well as the analog voltage more about this product can be seen by clicking this link. In conclusion, ioBridge’s IO-204 module allows for a simple to use remote sensing interface that allows the monitoring of measurements to a target anywhere in the world. Simply connect the preferred MaxSonar sensor to the module, link the module, and now you can remotely monitor your MaxSonar.